Some quotes from Chris Powell in the News Shopper piqued my interest this week. Now to be fair to Powell, he may be playing some form of mind games, keeping his team relaxed and not lifting energy-sapping nerves unnecessarily. However if he genuinely means it, then I think he is very much mistaken. The same obviously applies to the upcoming Sheffield United fixture too. 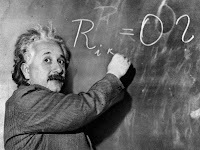 I will term what I will discuss as New York Addick’s, “Theory of Relativity”. At the start of the season, especially in a relatively hard-to-predict division like League One, the opening game is by definition 100% driven by ‘absolute factors’. In short, not only does a team not know with great confidence whether it will be competing at say the top, middle or bottom of the table, but it also doesn’t know which of its fellow teams will be competing there either! For example, whilst plenty of observers might have ‘fancied’ say Huddersfield or Charlton to do well ex ante based on the usual factors, likewise one could have made a similar case for the likes of Preston or Scunthorpe, neither of whom are competing. Thus on opening day and indeed for the first several games, the target is purely an absolute one. Get as many points as possible, then see where you are. At the other extreme, when the 46th game of the season kicks off in May, for most of those teams still with something to play for, the target is purely a relative one. In short during that final game, judging how your team is doing cannot be assessed solely on the basis of the scoreline of its own match. Defeat may be good enough if other results are going your way, and likewise victory may not be enough. By definition therefore somewhere between these two extremes of the 1st and 46th fixture of the season, a ‘tipping point’ must be reached where the importance of the absolute number of points achieved becomes superseded by the importance of the number of points relative to rivals. A good estimate for the fixture at which this tipping point is reached might well be the halfway point of the season, in our case the start of the Brentford game two Saturdays ago, our most recent League game. Thus with the acknowledged benefit of some hindsight, the 'tipping point' had probably already been reached after just 17 games, given the constituents of the top five. On an absolute basis since then, most Charlton fans would probably conclude our form has been just fine: 14 points from 7 games.....promotion form surely? However, whilst after 17 games the combined points gap of the four chasing teams behind us was 33, it is now only 24 (admittedly two have played one game more). So in an absolute sense we have been doing great, but in a relative sense (and extrapolating), it would be a very close run thing whether we would even keep our noses ahead at this rate especially if we treat the games directly against the quartet as 'just another game'. In order to explain better my theory, imagine say a 10,000m athletics race in which a pack of five runners has pulled clear of the field. At the start of the race, a runner (let’s call him Mo) would no doubt have had a time target in mind which if achieved, would likely win him a gold medal (this is the ‘absolute’ target). Indeed as the first few laps are completed, if a healthy pace has been set then this absolute target is important because the runner will know few will be able to stay in contention at this rate for 25 laps. However as laggards do indeed begin to drop away and just five runners remain in contention, suddenly Mo’s original absolute target becomes virtually obsolete. Even if the pace were to drop by a couple of seconds per lap, the remaining runners are too slow and too far back to catch up anyhow. Now it’s only about the tactics that the other four competitors adopt – the race will now be won or lost purely on ‘relative’ factors. If one of the runners ‘kicks for home’ then Mo can’t just look at his watch and determine that he remains on course for his original absolute target. He needs to kick too. Mo may end up winning glory with a time worse than his original ‘absolute target’, or finish 5th with a better time. Returning to football, the ‘absolute target’ in our case is presumably a points total which usually wins promotion. Whilst we can make an educated guess about how many points will be required (by extrapolating from current points, or looking at previous seasons), it remains a highly uncertain data point. Whilst this ignores the prospect of say a Carlisle or Stevenage making a run for promotion, I think my athletics analogy above is useful here - under almost all realistic scenarios, they are already too far behind. When assessing the importance of the upcoming two games, allow me for simplification and for the timebeing (see below) to assume all other games involving the chasing quartet are postponed. At that point, we are not just looking good....we are virtually home and dry, even with three of the other sides having games in hand. The 63% probability of automatic promotion discussed in my last post has probably become 85%. Conversely, let's consider if we lose the next two games. Imagine a nightmare scenario (but hardly an unlikely one) then in which all of the above games are won by a top five club, and we lose the two Sheffield games above. At this point after factoring in the devastating impact on confidence, I could make a serious case that we would be fifth favourites for promotion in just nine days' time! My Theory of Relativity is not a pessimistic one, far from it. I am not for one moment suggesting we are not more than capable of taking apart both of the Sheffield sides. But crucially it is vital to understand that it is only in these games that we can directly impact the form of our rivals; they really are 'six pointers'. Have two in a row, and you effectively have twelve points at stake in just three hours of football. It would be akin to our athlete Mo having the ability to trip up two of his five rivals on the back straight! My Theory of Relativity thus simply states that when form has become more relative than absolute (ie. when the tipping point has been passed), believing that fixtures against your direct rivals are 'just another game' is a gross mistake. Which given Chris Powell is an intelligent man, is why I suspect he doesn't believe it at all. I'm actually not as confident that he's playing mind games as you both seem to be. Yes, I'm sure he is an intelligent man. But he IS still a football man. Not a statistician. There's no way he would have considered the issue in the manner you have just done. Someone should ensure that he reads this. As always, an interesting read, if a little silly. Agree that the next two games come under the banner of 'six pointers'. However, what Powell is saying is that they prepare for every game with the aim of winning. In that sense it is like any other. If you believe there is some special measure he could take, by the same token it would mean that for 'lesser' games he holds something back - and doesn't try as hard. @daveydanger, you may be right but if so then the News Shopper reporter completely misinterpreted him. The opening paragraph says, "Chris Powell claims Charlton’s trip to Sheffield Wednesday on Saturday and the following weekend’s game against Sheffield United are no more important than any other league fixtures." Clearly this is total nonsense as I've shown above. Powell has been fairly gung-ho all season, and it has paid dividends so far. For example he has left Morrison upfront in the final minutes of some matches to try to secure three points instead of one. However when there is potentially a 4-point swing as opposed to merely 2, then I think the rationale is not so clearcut. I don't know it may be logical to be EVEN more cavalier maybe, but either way I do know different factors drive the decision. Lot of sense in your post, as usual. If we factor onto that our history of New Year collapses then there is no reason to be complacent. I trust that CP is,despite his public ramblings, is in fact building up the inner sanctum ready for two crucial games. They may not be quite as crucial as the Leeds play-off games, but if they went the wrong way they could be. Let's hope we are up for them. As always, a really well thought out and enjoyable read. However, I think you have overlooked a significant point. I think it's much more likely that this particular comment was actually directed at us, the fans. Managing expectation, and all that. I've noticed Powell regularly reminds - or should I say warns - us about not getting carried away, particularly in his programme notes, and this is one such occasion that he may well have dropped a subtle hint that promotion will not be won or lost regardless of the results of the next two game. In this respect, he would be 100% correct, of course. Behind closed doors his cards will be kept firmly to his chest, of that I'm certain. I will bet $1 to win $100 (or pounds or zlotys) on Charlton missing the playoffs. This is not a comment on Charlton's talent, merely a statement about the underpricing of fat tails. Injuries, suspensions, a structural flaw in the stadium, a gust of wind; collectively they produce more uncertainty than people anticipate. Who will sell me this out of the money option? Three-quarters of the stadium dates back only 10-15 years or so, whilst the oldest part (where a structural flaw is most likely to be located) is where we house the away fans, and we don't care about them. Agree about the injuries, suspensions and gusts of wind though (especially so close to the Thames!). I'd be happy with just two points from the Sheffield games. That would keep them at bay, for a while at least. It is scary when you look at what may (will) happen if we lose both games, especially after all the hard work put in so far this season. But at least we will have an opportunity to put things right in the 20 games still left after these! COYA! Great post NYA!! And to extend your analogy of the 10,000 metre race, I really hope we’ve broken free of three of the leading pack when we hear the bell because if not that last lap will be unbearably tense!! Two wins against the Sheffields and Chris Powell will almost be able to kick for home!! I’m sure Powell understands the critical importance of the next two games even if he hasn’t analysed it the way you have. An additional reason for playing it cool is that he also knows that if [God forbid] we lose both games he’ll need to get the players right back up and in shape to win the next three against Exeter [A], Bury [H] and Rochdale [H]. The last thing he’ll need in that grim scenario is players who feel they’ve just lost two Cup Finals. Player motivation and management is key here. As to what he might do differently given the importance of the two games, he’ll no doubt have considered setting up more defensively at Hillsborough, but my guess is he won’t have thought about that for long; I’ll be surprised if he doesn’t pick the XI that started at Fulham. Notwithstanding the score line, I thought it was a very decent performance at Fulham and more of the same will do nicely at Wednesday though I think we can expect Wednesday to press higher up the field and for us to get the ball forward more quickly. Fingers crossed for a bit more luck in the box. At both ends!! I also think the games are more important. I am happy the way we have bounced back from the 2 defeats we have suffered this season but we can argue these were unlucky defeats and not too demoralising. When we beat Huddersfield earlier on it ended their unbeaten run and then they dropped points in the next few games afterwards so apart from the dropped points the psychological effect of a defeat can't be ignored. I'm expecting at worst a point tomorrow with BWP getting a goal. Great post as always. There is no doubt the next two games are 6 pointers but I guess for SCP the aim has to be the old guide of 2 points per game average for the last 22 games. That would leave us with 98 points, so a target of 99 points for two teams to beat (given that we currently have a much better goal difference). It would leave Sheff Wed a target of 2.27 pts per game, Sheff Utd 2.33, MK Dons 2.41 and Huddersfield 2.48 - daunting targets indeed, given that our own spectacular start has been at the rate of 2.25 pts per game. So neutralising the Sheffields with draws would be a good start, though I'm confident for 4 points. If we were to lose both, assuming we bounce back mentally, we would need 2.2 points per game for the remaining 20 matches, just below what we've achieved so far. Here's to a famous win tomorrow! Yep, good way of looking at it thanks. Erm, yeah I think I made the point that they were big games, and that Powell probably understood that. I will have my humble pie just as soon as I've finished the humble pie I am currently eating for having bought buildings insurance in 2011, and not having needed to claim on it (how can I have been so stupid?). I am glad you are 'quite clear' that Powell is a phenomenal manager. Since you only look at results and not the impact of other contributing factors, I assume you were also 'quite clear' at the end of last season that he was a useless one? Amazing what 24 new players can do - I will continue to reserve judgment thanks. NYA - ignore him, no need to sink to his level. What we don't know is what influence Powell had on picking those players. I guess he was reasonably influential in getting Yann to play for us, for example, and he's been a revelation (actually he's so good at winning knockdowns we are starting to hoof it up to him a bit too often I think). Ultimately however we are a 'championship' level club - well we have been for the last 50yrs or so, give or take a few seasons above and a few below that. Until Powell can get us into the top half of the Championship and beyond then the jury will be out. He's doing just fine for now though.